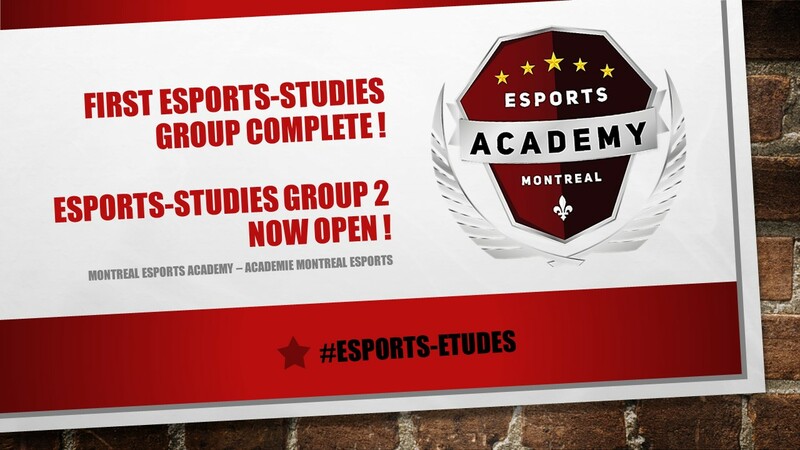 On October 30, the Montreal Esports Academy (MEA) Staff team is proud to announce that enough pre-registrations have been gathered to fill its first Esports-Studies Program group composed of young aspiring students who will enter the first 2019-2020 Class at high school level to become, in the coming five years, the future e-athletes of Quebec! Indeed, barely a month after the first Press release here and the “Portes Ouvertes” event held at Edouard-Montpetit High School on September 30, 2018; We are delighted to have witnessed the enthusiasm of young Quebecers and the support of so many parents to help their young offspring meet the challenges ahead of them in their journey towards Academic Excellence and Esports Excellence. We are counting several Grade Six students from Junior school entering Edouard-Montpetit High School in 2019. We have a few high school students, currently enrolled at Edouard Montpetit High School, who are going to be part of this special project that is Esports-Studies Program under the category of “Concentration Sportive.” Finally, we have two high school students who have decided, with the agreement of their family, to make a file transfer to Edouard Montpetit High School to follow the Esports-Studies Program. Both directors of Edouard-Montpetit and the MEA are working together to prepare the ground for Fall 2019. With the creation of a second group of students, it is the turn of Montreal Esports – the primary financial investor of the MEA – to allow the investment of additional computer systems to increase the capacity of our training stations. Thus, the “Arena” containing twelve high-performance computers will be refitted to allow twenty or more additional computers stations. This is a big project that the MEA and Montreal Esports will be looking at in the coming months. In the meantime, esports enthusiasts, gaming enthusiasts and people of all ages can have a taste of what is structured esports training right next Summer! We have already launched the pre-registrations for our next successful day camps: the ESPORTS DAY CAMPS 2019! To find out more about the Esports-Studies Program, you can read the first overview article about Esports-Studies Program Details here. If your child at high school level is interested in being part of the cohort of the second group, or if you want more information: you need only to write us at info@mtlesportsacademy.com or dial 514-545-9100 extension#201.